Quick, who’s your favorite Croatian painter? I chose Zagreb as part of my first trip to Eastern Europe because it just seemed like an unlikely place for a guy from Arizona to end up. And on my first day there, I go to the Modern Gallery, a museum of Croatian painting and sculpture. I corner a girl who works in one of the rooms on the top floor and ask my usual silly questions about the art. Afterwards I ask my impromptu tour guide about the food. “Oh yes, we have great food all over the Balkans!” she says, brightly. Wait. Am I in the Balkans? When I was growing up, my parents used to listen to the news on NPR at ungodly hours of the morning. And in the early 90s NPR spent a lot of time talking about Serbs and Croats. Of course, I understood nothing of Yugoslavia, geopolitics, the fall of the Iron Curtain, etc. I was nine. But here in the museum, twenty-something years later, I suddenly realize that this girl, with her tongue ring and half-shaved head, was a Croat, and that somehow I had made it to the Balkans. I guess I had never given these things much serious thought. If you had said “the Balkans”, I would have visualized an old woman in a head scarf, with bundle of sticks on her back, hobbling towards a refugee camp. I don’t know. Call it American ignorance. It just sounded sort of vague, dangerous and war-torn, and somewhere out there to the east. And the conflict between Serbs and Croats conjured up images of tribespeople dressed in tatters, waving their Kalashnikovs defiantly in the air and ready to fight to the death with anyone from more than three towns over. 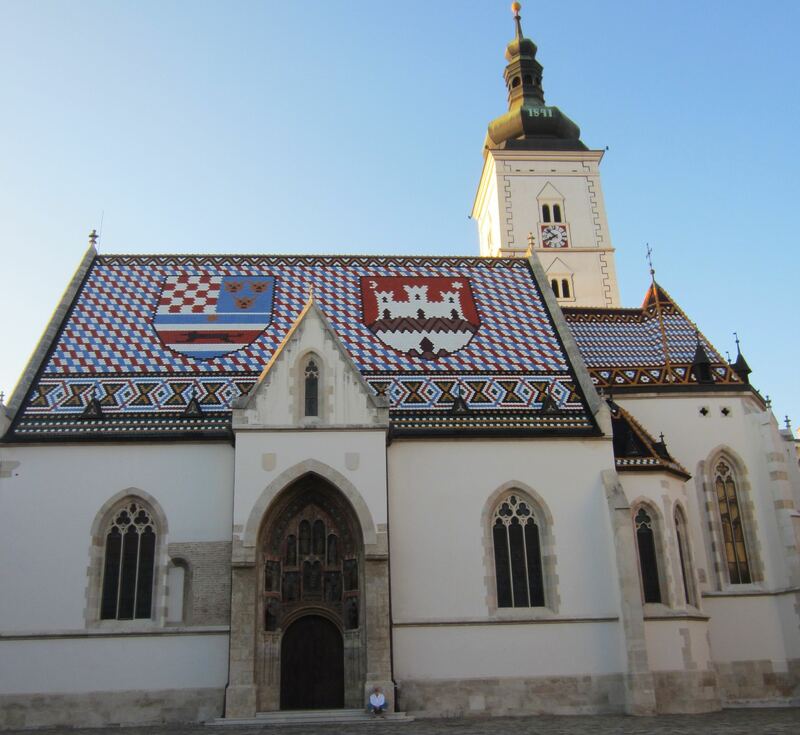 Leaving the museum, my eyes are opened–most of these people walking around are those very same tribespeople–those very same Croats I had heard about on NPR as a kid. The waiter who messes up and then claims that actually, yes I did order the most expensive thing on the menu? Croat. The surly fat guy grilling burgers across the street from my AirBnb? Croat. The next day I go to the mountains. And while waiting outside Tomislavov Dom Hotel for the bus back to town, I strike up a conversation with a couple of guys. The thin one is German, and the fat one says he’s from nearby. He seems pretty nice, and has lived in the US, so I figure he knows something about American ignorance. I go out on a limb and confess my shock that he’s not some sort of barefoot Kalashnikov-waving tribesman. The bus isn’t coming (transport in that part of Europe is kind of a joke, but that’s another story) and I decide to walk back down the mountain to Zagreb, so I say goodbye. The next day, my last in Zagreb, I go to the Homeland War photo exhibition at the Croatian History Museum. I’m amused to find that a lot of the Croat heroes fighting for independence look like they stepped right out of an early-90s music video and into a war. They look cool. Like the kind of guy you wish you had as an older brother. As an American, especially one from a place with so little history, it’s difficult to imagine yourself as part of a tribe. It’s hard to imagine yourself as part of a story that goes back 2000 years or more. But for a lot of people, that’s the reality they live every day. And from time to time throughout history, they have to fight to preserve that identity. Eye-opening, to say the least. Well, kids, this is sort of a departure in tone from my usual type of wit–if you can even call it that. P.S. If you’re in Zagreb, you should also check out the Museum of Broken Relationships. It’s a bit depressing–you might need a drink afterwards–but for 25 kuna it’s a great deal on a highly original museum.